This is one of those photos which is really priceless, because I had some trouble initially with this ancestor. Of course, when you come upon a person with a name like Joseph Jones, and you don’t know much else about them, it can be exceedingly difficult to narrow search results down. 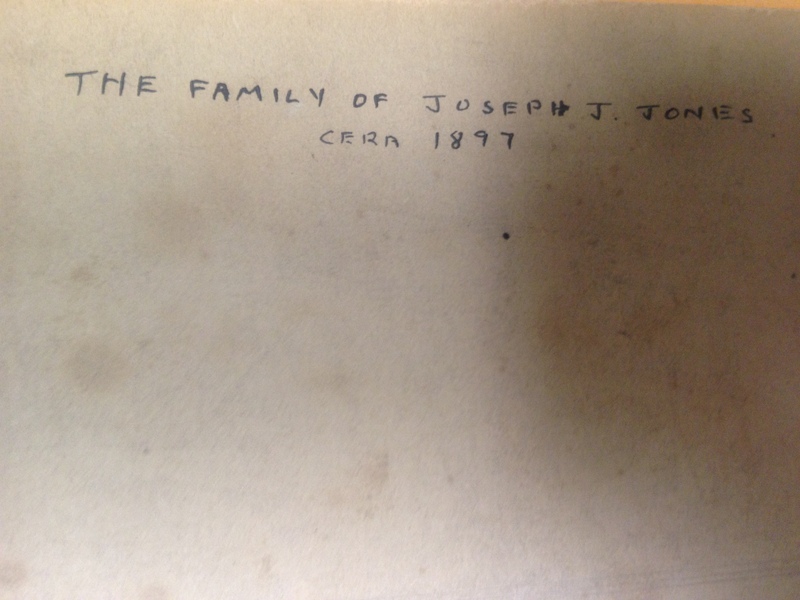 On the back of this photo, it says Family of Joseph J. Jones, 1897 There’s also a drawing of some kind of free mason-like symbol, which is drawn in pencil and not pen like the photos caption. 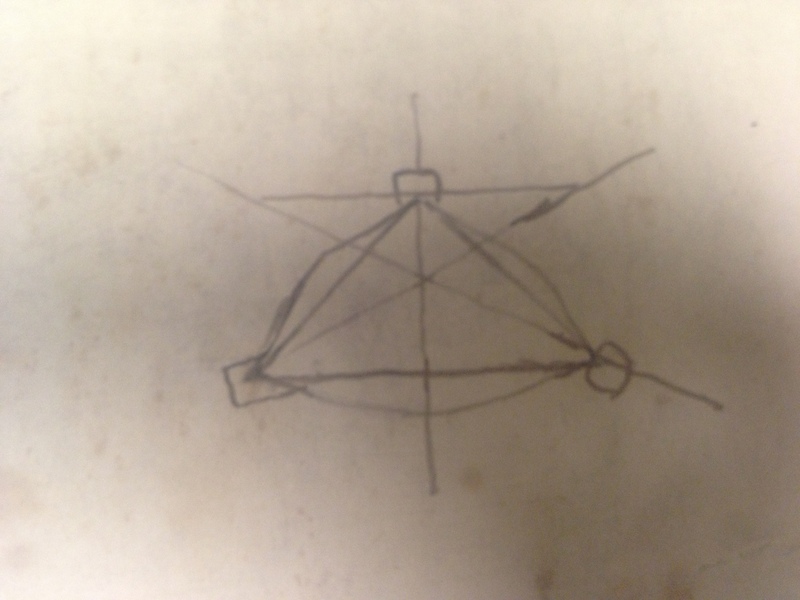 It almost looks like a doodle, and I am guessing it was not drawn at the time the caption was written. The man on the right is my great great grandfather, Joseph J. Jones, born in England in 1858. I don’t know when he came to America, but his eldest child Lewis was born in Indiana in 1890, according to the 1900 Federal census, so it was sometime before then. He was a quarryman in Bloomington, Indiana, where they have huge amounts of limestone and, well, quarries. The children are, left to right: Lewis, Charlie, Frank, and Elsie Nell, who was my great-grandmother (isn’t she precious with those little curls!). The woman seated is Nellie May (Hopkins) Jones, my great great grandmother. The woman standing behind them is Eliza J. Hopkins, listed as sister-in-law on the 1900 census. Here comes an interesting twist (isn’t there always one! ): by the 1910 census, Eliza Hopkins has gone from sister-in-law to wife, and her name is Eliza Jones. Now, this probably wasn’t all that uncommon in those days. 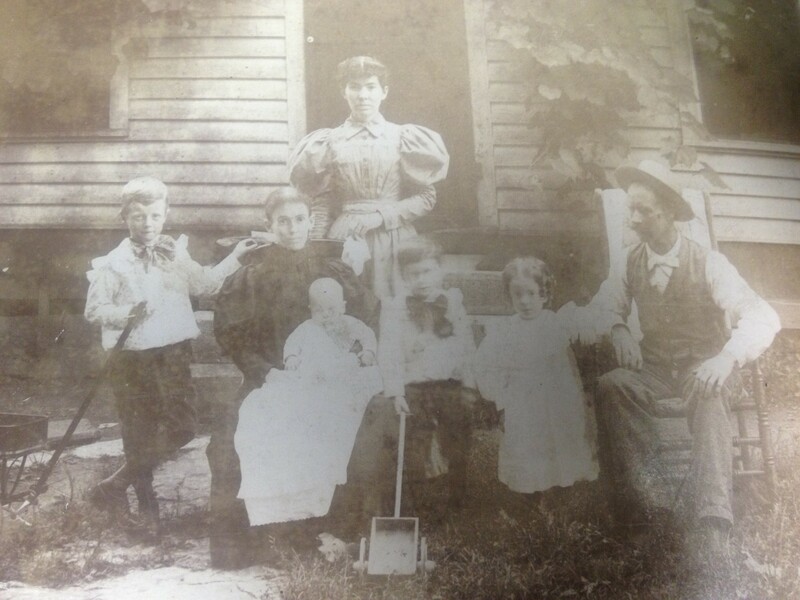 Family often moved in with one another as a means of survival, especially to help when relatives become ill.
Nellie May (my great great grandmother, seated) was dead by 1900. This picture was taken in 1897, so helps me narrow down her date of death. I can tell she is very frail here, so if I had to guess I would say she died (not long after this picture was taken) of consumption, which we now call tuberculosis. Overall, this picture makes me sad and happy at the same time. It’s happy because the children look like they are kind of having fun, they are all dressed up, and I like how Joseph is looking over at the kids trying to get them to sit still. It’s very similar to a modern family photo in that way. It’s also sad because Nellie May is clearly very ill, and this is my one and only picture of her. Also, Uncle Charlie will go on to fight in WWI and my great grandma Elsie died young, so when I look at this I feel a bit apprehensive of their futures. Photographs really do speak volumes, don’t they? This entry was posted in Friday Faces of the Past and tagged Family History, genealogy, History. Bookmark the permalink. Yes they do! And this is a great photo, thanks for sharing. This is a great photo and a terrific (happy and sad!) story along with it. This is a great example of getting the most out of your documents and pictures. Thank you so much, that is very kind!! Looking forward to following your blog as well 🙂 Cheers! Wonderful picture and such a touching story. Thanks for sharing this.